I’d like to show you a quilt I made a few months ago for Dear Stella to hang in their booth at Quilt Market. It’s called the Hexactly quilt, and it’s designed by Sam Hunter of Hunters Design Studio. The folks at Dear Stella had me make the quilt using their Chroma Basics collection — and it only used half the colors they have available! These are great basics that will mix with so many prints, and they give a bit more texture than a plain solid when you need it. Check out Dear Stella’s blog post to see some other great projects made using the Chroma Basics collection (which is by Rae Ritchie). This particular pattern affords you lots of negative space to fill with modern quilting, if you’re into that sort of thing! You can get the pattern HERE. And don’t be scared — there are NO Y-seams in this quilt — it’s super easy and fast! Here — I’ll give you a chance at a head start. Since I had some bits and pieces left over from making my version, I’m having a give-away for a starter pack so you can make your own Hexactly quilt. Up for grabs is TWO packets of 29 9″ squares of all the colors shown in the quilt above. All you’ll need to do is choose the background of your choice to go with them, and snag a copy of the pattern from Sam! Or choose another project to use the squares in — I’m sure there are plenty of ideas out there! To have a chance to win one of the packets, all you need to do is leave a comment on this post. I’ll draw for two winners on Tuesday, August 1st. UPDATE: The winners are Cynthia and Donna! Thanks, everyone, for playing along! I particularly like the background that Dear Stella chose to highlight Hexactly. Ooh love your quilt. Would love to win! This quilt is so pretty. I love the fabrics that were used! Thanks for the chance to win some of it. That quilt us gorgeous..such clean lines and I love the color arrangement. Thanks for sharing! I would love to purchase that pattern where doing apply? So fresh and modern! Love the variations in colors of solids. 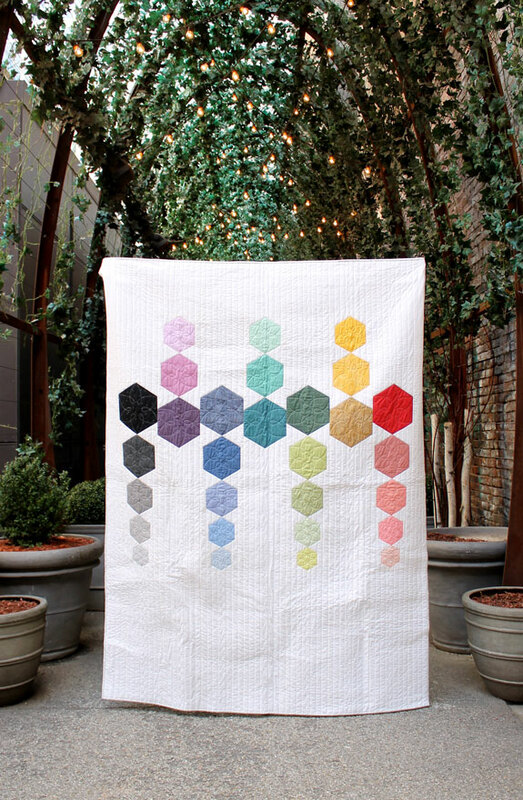 I love the modern simplicity of this quilt, the color transitions and the stacked hexagons. And what a great negative space to practice quilting on! Great job to you and Sam Hunter. I’m loving hexies right now and I love this idea! I absolutely love those Chroma Basics! Love what you did with them, too! Thanks for the chance to win. Your quilt is inspiring! Thanks for the chance to win. I’m in the mood for hexagons right now! I think I’m going to start an obnoxiously long-term hand piecing project with them. Now to find the right design! I’m curious about how the hexs are set together. I just finished an “I Spy” quilt using hexs and triangles, but the hexs were all the same size. You don’t have to put me in the drawing. . .I have way too much fabric as it is; but I did want to comment on the quilt. This quilt looks fun to maker?. Thanks for sharing. I’ve been making quilts that go to children who are hospitalized. I’ll bet one of them would love to have a modern quilt. Please enter my name in this drawing, and thanks for your generosity. Complicated in your quilt. I really like the softness of the coloring – very well done! Thank you for the collection of fabric. It will be fun to include them in a project.